On February 3rd 1915 the art dealer and philanthropist Sir Hugh Lane wrote a codicil to his will drawn up 16 months earlier. In the later document he reversed the clause that left a collection of 39 paintings to the National Gallery in London and instead requested the works be given to the Municipal Gallery of Modern Art he had founded in Dublin in 1908. Three months after writing the codicil Lane was dead, one of the victims of the Lusitania sunk by a German U-boat. When his will was opened there was widespread consternation in Ireland since he had told many friends of his intention to leave the group of 39 pictures to Dublin. But then Lane’s aunt, the redoubtable Augusta, Lady Gregory discovered the document in which he reversed his earlier intention. It looked as though her nephew’s wishes would be honoured. Why is it that Lane’s own clearly expressed desire has not come to pass? The legal explanation is that although he signed and initialled his codicil, the document was not witnessed and therefore was judged invalid. It is worth noting that a state dispensation had already been agreed whereby wills by men who died fighting for Britain during the First World War were not required to be witnessed, nor were they under Scottish law. However such leniency was not then and is not now applied in the case of Lane’s codicil for one simple reason: the value of the paintings he left behind. 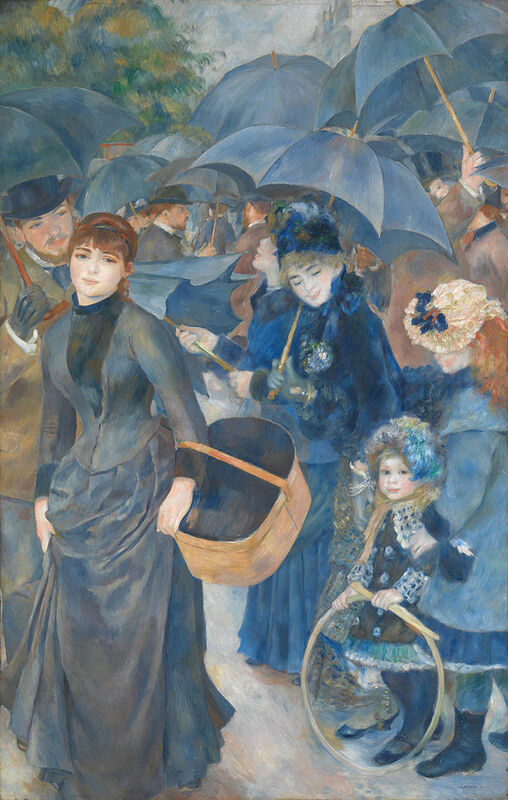 Among those judged to fall below the standard were Monet’s Lavacourt: Sunshine and Snow and Renoir’s Les Parapluies. These, it was requested, Lane might like to remove from the premises at his convenience. In fact, all the works remained in the gallery’s storage and were there at the time of their owner’s death. It was only in the aftermath of this event that the merit of the collection was given serious consideration, especially since at the time there were few Impressionist pictures in Britain in public ownership. Hence the resolve to stick to the letter of the law and to disregard the contents of Lane’s codicil. Since 1959 some of the paintings have been permanently and others temporarily on loan to the aforementioned Dublin. But Britain continues to assert her right to ownership of them all and it is this claim that continues to rankle in Ireland. When Roy Foster visited the National Gallery’s just-closed exhibition devoted to the art dealer Paul Durand-Ruel, he noted it included several of the Lane pictures, all of which carried notices asserting location and ownership as being ‘National Gallery, London.’ The accompanying catalogue furthermore carried the information that Monet’s Lavacourt had entered the collection in 1917 ‘as part of the Sir Hugh Lane Bequest.’ It is hard to think of other instances where a donor’s intentions have been so flagrantly ignored, and on such flimsy grounds. Given the improvement in Anglo-Irish relations over the past decade surely now is the moment, as Foster commented, to right a historical wrong. Introducing the talk last week, the National Gallery’s director Nicholas Penny accepted that while his institution claimed legal ownership of the pictures, it ‘has long conceded that Dublin has some moral claim to them.’ There are occasions when moral entitlement trumps legal pernicketiness and this is one of them. A century after Sir Hugh Lane’s death, the time has come to respect his wishes. What for God’s sake is an ‘impressionistic icon’?